It is unclear to me if you can run this board at the 1.8V like the mini breakout. I have a 5V signal and use an external level shifter, so it seems more logical to just shift to 1.8 externally, and not to 3.3 for this block. So if jumper is not used, is it 1.8V ? Does this I2C block allow the connection of the MCU I2C (I2C_6)? Can I use a GPIO Block to setup an interface with I2C device (e.g. LiPo Fuel Gauge) instead of this block? Anybody ever tried to use that block with a mics_vz_89t air quality sensor ( 3.3V I2C ) ? If I set the voltage jumper to VSYS, would there be any problem with powering the whole stack by providing 4.5V at JP2? Trying to use this block with a level shifter on the jst connector. So the Edison does see the LCD, it just isn't working otherwise. I have hooked this up to an Edison sitting on the arduino breakout and it works just fine. The Schematic has 200K resistor from VREF2 to VCC but the board has 300K. I wanted I2C block to work with TMP-102 sensor. Wonât. Using i2cdetect replies with errors âi2c_dw_handle_tx_abort: lost arbitration.â Using pull up resistors from 680 to 10k changed nothing. 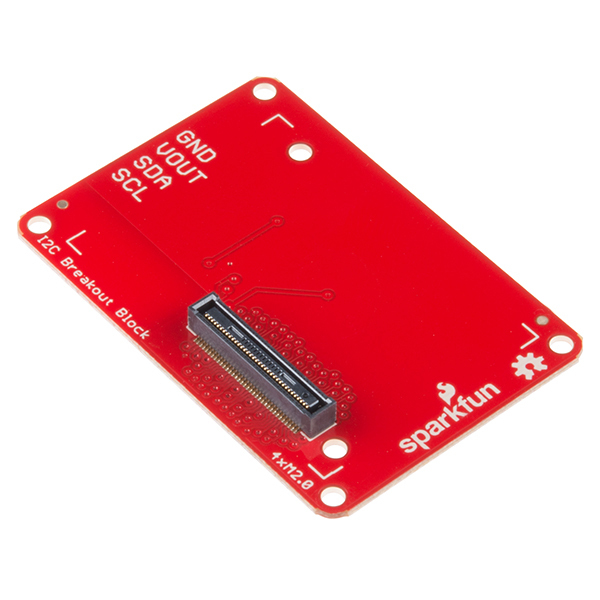 I am trying to add a UART to the edison over i2c using this block and the SC16IS750 breakout (https://www.sparkfun.com/products/9981) because the Edison has only one UART and I need to attach 2 or 3, but it is not detected. I've set the device address to 0x94 on the SC16IS750 which should be detected as 0x4A I believe. I tried 'i2cdetect -r 1' but it is not detected. 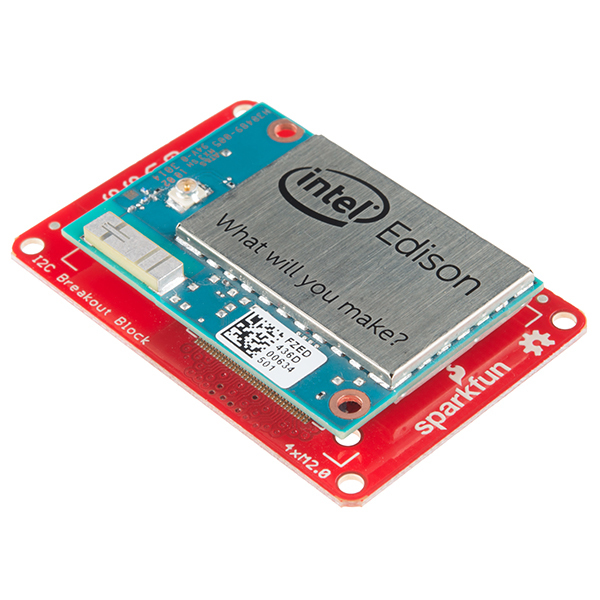 When attached, I do detect the SparkFun Block for Intel Edison - ADC on address 0x48 for what it's worth. Any hint on using this interface? I am seeing about 6 holes near the hirose connector. Instead of stacking the edison to this block, can I bring-in 5 lines (VSYS, 1.8V out, SDA, SDC, GND) from the mini-breakout and then connect them to 5 of the 6 holes, would it work ? If so, which hole correspond to which line ? If you are looking for an I2C level shifter may I suggest our PCA9306 Breakout? Those holes are 13mil vias. Not suitable for soldering. You can stack the I2C block on the mini breakout. you might need to trim the jumpers on the Mini Breakout to make clearance for the I2C header. That might save you a step and make a cleaner stack. Good luck! Hi SF! There are no Blocks containing I2S (audio codec) signals. 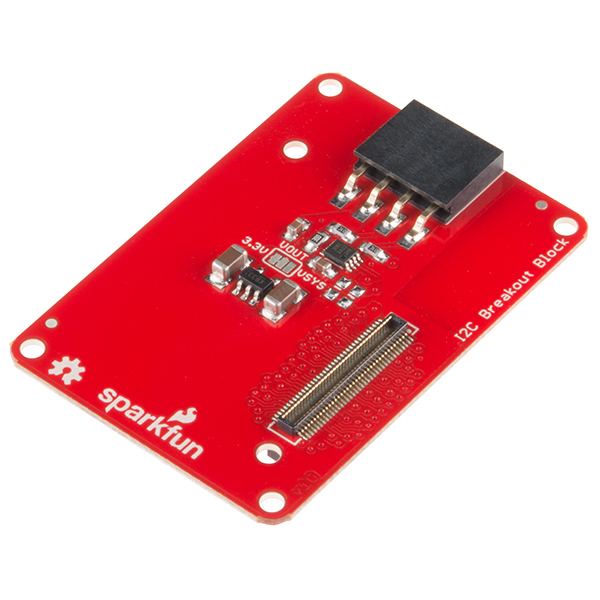 Most often they are used with I2C so please adding I2S signals to this board or creating a new one with I2S + I2C + SPI signals. Alternatively or additionaly consider creating Audio Codec Block using CS42L51, CS42L52 or TLV320AIC3204 which are Low-Power versions and dosn't require level conversion for the signal. Also these codec is supported in ALSA ASoC drivers. An audio Block is in the works. When? Not sure. can i power edison with this? No, you must use a Console Block, Base Block, Battery Block, or with caution a GPIO Block. Wait....the video states bus lines can support 3.3v-4.5v devices. The description above says it can " level shifting it from 1.8V to your sensors voltage." So which is it? And is 4.5v really the max? So if I were to hook up an Arduino as an I2C slave then that would not be a good thing. The original design was the sensor supplied the reference voltage. We are rev'ing this to include a 3.3v LDO. We will have a jumper to select the 3.3v bus OR VSYS (3.3 - 4.5v). We were trying to support 5v devices but it looks like without a solid 5v boost it's not seeming feasible unless you were to supply it externally. There will be a way to use 5v with the board but it will be a "white wire" hack that will require an external 5v supply. exactly how many I2C channels can be addressed by the Edison? how many, then, in theory could be stacked together? If by channels, you mean devices? That's limited by the I2C Spec at 128 devices. This board may be stacked to provide multiple level shifted outputs. However these will be all on the same bus. The purpose of this board is to simply protect the I2C on the edison from higher voltages used by common sensors. I don't mean to be that guy... but shouldn't "We do not currently have an estimate of when this product will be back in stock." Be "We do not currently have an estimate of when this product will be in stock." As Pre-Order implies it's never been in stock? 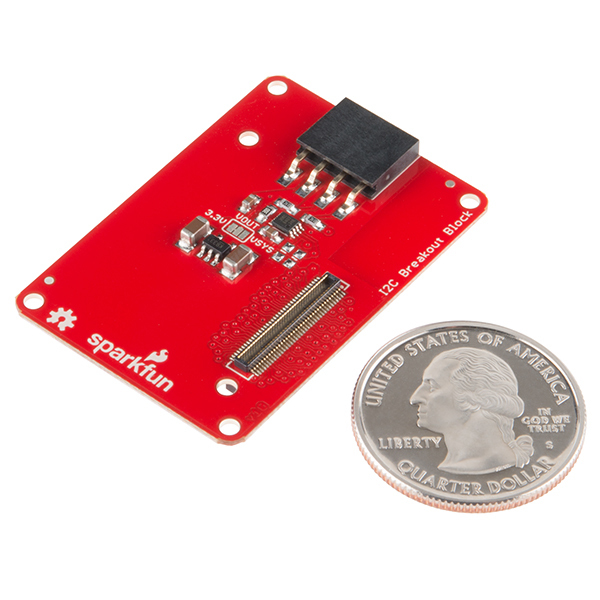 Does the Edison require pull-up resistors on the I2C, or are those already on the board. If the Edison doesn't add the pull-up resistors, does this board have the resistors? No need to add resistors- they're included! Maybe it is just me but I hate it when pullups are added onto I2C devices. Some sensors have pullups on them and they just cause problems if everyone pulls up the damned I2C bus. I even turn off Arduino's pullups on the SDA/SCL line. Sorry for rant. We typically include I2C pullup resistors on our products but add a solder jumper to allow disabling them if needed. The announcement video mentioned that the I2C block level shifts up to input (system) voltage of the Edison (3.15 to 4.5 V). Have you considered adding a jumper on the board to allow the 'high' voltage to be tied to the 3.3v (@250mA) regulated output that is coming out of the Edison's PMIC? There is talk of adding an external VReg to address this. We've considered it. In the end, we decided to pull from Vsys and regulate down on individual boards when needed to avoid loading that 3.3V bus.